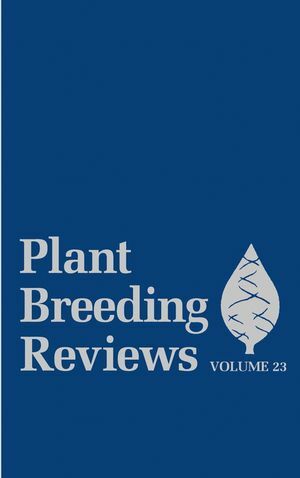 Plant Breeding Reviews is an open-ended, serial continuation series of review articles on research in plant genetics, especially the breeding of commercially important crops. This detailed analysis bridges the gap between the specialized researcher and the broader community of plant scientists. 1. Dedication: Dermot P. Coyne Bean Breeder, Geneticist, Humanitarian (James R. Steadman and Jules Janick). 2. Strategies for Genetic Improvement of Common Bean and Rhizobia Towards Efficient Interactions (Carla Snoeck, Jos Vanderleyden, and Stephen Beebe). III. Selection of Optimized Rhizobium Strains for Bean Inoculation. IV. Conclusions and Future Prospects. 3. Developing Marker-Assisted Selection Strategies for Breeding Hybrid Rice (Yunbi Xu). II. Features of Hybrid Breeding. III. Components of Marker-Assisted Selection. V. Traits Requiring Testcrossing or Progeny Testing. VIII. Gene Introgression and Whole Genome Selection. IX. Prediction of Hybrid Performance and Heterosis. 4. Significance of Cytoplasmic DNA in Plant Breeding (Ursula Frei, Edmundo G. Peiretti, and Gerhard Wenzel). II. Some Basic Information on DNA in the Cytoplasm of Plants. III. Agronomic Traits Influenced by Cytoplasmic Factors. IV. Breeding Using Cytoplasmic Factors. 5. Flowering, Seed Production, and the Genesis of Garlic Breeding (Philipp W. Simon and Maria M. Jenderek). III. Garlic Taxonomy and Genetic Variation. IV. Garlic Growth and Reproductive Biology. VI. Progress in Garlic Breeding and Future Prospects. 6. Cultivar Development of Ornamental Foliage Plants (Richard J. Henny and Jianjun Chen). II. Origin of New Cultivars. 7. Preservation of Genetic Resources in the National Plant Germplasm Clonal Collections (Gayle M. Volk and Christina Walters). II. Clones as Genetic Resources. III. Maintenance of Genetic Diversity in Clonal Collections. IV. Clonal Collections in the NPGS. VI. Cryopreservation: Variables to Consider. VII. Application of Cryopreservation Technologies to Vegetative Materials.